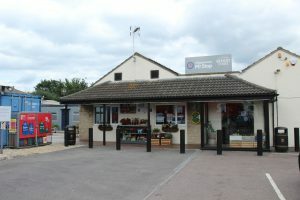 The Chippenham Pit Stop is the winner of Truckstop News‘ 2017 Truckstop of the Year award. This is the type of establishment all truckstops should aspire to be, and the type of facility the road haulage industry needs to see more of built to cater for overnighting lorry drivers. The Chippenham Pit Stop is a family-run business which has been providing drivers and passengers with everything they need on one convenient site for over 15 years. It’s immaculate – very clean with modern facilities and a joy to visit. The food was affordable, yet of excellent quality; the ambience feels more like a restaurant than the clichéd ‘greasy spoon’. This privately-owned site is 600 yards from M4 Junction 17 along the B4122 sign posted Sutton Benger, providing easy acess for all road vehicles. Adjacent to the filling station is a lorry park with 85 spaces and a service building. It is ideal for traffic heading to and from South Wales. Parking with a £6 food voucher is £21.50 while parking with a £6 food voucher and a shower token is £23. SNAP account parking is £17.50 but the food voucher not included. Fuel Card Payment with a £6 food voucher also £21.50. The Restaurant opening hours are 0600-2130 (Mondays-Fridays), 0800-1430 on Saturdays and 0800-1200 on Sundays. The store is open Monday to Friday 0600-2200, Saturday 0800-1900 and Sunday 0800-1300. All breakfasts are accompanied with award winning Hobbs House Bakery toast and a choice of Fair-trade fresh ground coffee, tea or hot chocolate. The Pitstop Traditional Breakfast is £5.79 and includes bacon, free-range egg, sausage, hash brown, beans and plum tomatoes. The Wiltshire Farmhouse Breakfast is £7.29 and includes locally reared and sourced meat from Styles’s family butchers with a gourmet sausage, dry cured bacon and free-range egg along with Portobello mushroom and grilled, fresh tomato. The Pitstop Full Tank is £7.49 and is a heartier version of the Traditional Breakfast with double bacon, a brace of eggs, two sausages, hash browns, mushrooms, black pudding, baked beans and plum tomatoes. The Wiltshire Farmhouse Brunch is £8.29 which is the same as the Farmhouse Breakfast with the addition of beans, an extra egg and bubble and squeak. The Fast Lane Breakfast is £3.99 and is two slices of hot, buttered, toast topped the choice of two breakfast items – from bacon, sausage, eggs, baked beans, grilled or plum tomatoes or mushrooms. Scrambled egg and bacon on a toasted English muffin costs £4.29. Breakfast baps are £3.99 and include bacon, sausage and egg while breakfast Ssandwiches are £2.99 with a choice of egg, bacon or sausage served in a soft bap/sandwich. Extra items are 50p each. Toasted Teacakes are £1.99 as is homemade porridge, cereals and hot buttered toast and preserves. A mug of tea is £1.20 and speciality teas are £1.79. Coffee – which is freshly ground, fair trade coffee made from sustainably farmed beans – vary from £1.60 for Americano while lattes, cappuccinos and mochas are all £1.99 as is hot chocolate. Cold Drinks are 95 for a can, bottled water is 70p, a glass of orange or blackcurrant squash is 50p while fruit juices start at 80p. Smoothies are £2.50. Also available are a selection of canned and bottled beers from £2.50, house wines from £2.50 for 175ml and £3.50 for 250ml. 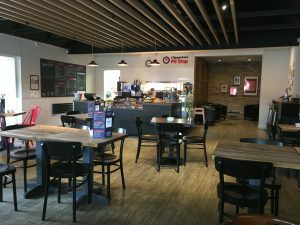 The Pit Stop offers a varied and excellent range of main meals, including pizzas and traditional meals. There is a choice pizzas which include fresh ingredients on a 12-inch stone-baked thin crust and these are cooked to order. The basic mozzarella and cheddar is £6.99. Sausage, bacon & mushrooms is £7.99 as is ham and pineapple. Pepperoni, red peppers & mushrooms is £8.99 as are pepperoni, Jalapeño peppers, onions and peppers or ham, pepperoni, sausage and peppers. At £6.99 are Wiltshire ham, egg and chips, the steak burger, Pitstop Salad or the Classic Pitstop Cottage Pie. 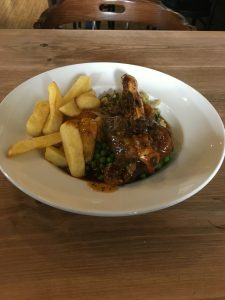 Moving up the scale are Steak and Ale Pie (£7.29), braised lamb shank with mint gravy or an 8oz Gammon Steak are both £7.99. The mixed grill is £9.99 and the 10oz rump steak and chips is £10.99. On TSN’s visit we had the lamb shank, and it was superb; a decent sized portion and cooked just right. Deserts are typically £1.99-£3.29 and include the crumble of the day, syrup sponge, apple pie, ice cream sundae or fruit salad. There is also a selection of homemade cakes from £2.29. A children’s menu (for under 12s) is also available and includes a mix of meals such as homemade soup, jacket potatoes, steak in a baguette, cheesy garlic bread, cheesy chips and omelettes. All items are available to take away and if you’re in a hurry, you can phone ahead with your order on 01249 750645. 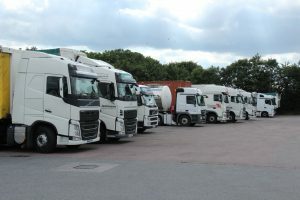 The one thing that strikes you when you visit the Chippenham Pit Stop is the superb parking – a neat, tarmac covered, pothole-free area for up to 85 trucks to park. CCTV provides 24-hour surveillance. There is fuel available 24/7 for fuel cardholders only and the site is an official dealer for Adblue Solutions. It also sells both Standard gas oil and Ultra Low Sulphur diesel. The CPS accepts all the major fuel bunkering cards. Once you have parked, you can go to the superb café area for a meal. For those stopping over, then there are clean and modern showers with underfloor heating and 24-hour toilet facilities. Other facilities are an outdoor seating area, large flat screen TV showing BT Sports, a bar serving local ale and cider on tap, and there is also a log burner. There is even an outdoor gym. Those who apply for Pit Stop Privilege Card will earn points every time they make a purchase. In the restaurant and shop you get a point for each £1 spent, a point for every 10 litres of fuel or Adblue, plus free wi-fi, shop promotions and tea or coffee for only £1 when you bring in your free mug.